I have a deadline for some secret sewing rapidly approaching, and I ran out of thread for the quilting. Instead of impatiently waiting on my order to arrive, I decided to play with my scrap bin today. I have a fairly small plastic storage bin that I toss large-ish sized scraps as they get created in my projects. The lid was having trouble staying shut, so I thought I would organize the fabrics by color. I placed colors on my design wall by color grouping, and a beautiful bit of rainbow play is what “stuck”. I decided to leave the whites, low volumes, grays, blacks, and prints that had more trouble reading as a solid color in the scrap bin. As you can see in the photo above, I had more reds (from the Marsala challenge), oranges, yellows, and tealy-greens on my cutting mat. Because I am dealing with much different amounts of fabric for each color grouping, I knew I wanted to play with improv. I started with the pinks, and it was a lot of fun to just sew pieces together, press, trim a bit, and repeat. The pink block measures 8″ by 13″. I had more reds, so the first red block finished out at 13″ by 11 1/2″. Not wanting much to go back into the scrap bin, I also made a second block that measures 8″ by 13″. I really like how improv allows for such differences in blocks, and block construction went pretty quickly. I probably sewed for an hour and a half to make these 3 blocks. I think it is pretty amazing how much shrinking happens when sewing it all together, too. I didn’t throw out too many trimmings, and only a few scraps have gone back in my scrap bin. I don’t know how far I will be able to take this fun interlude of color play before I have to hop back over to other projects. Also, this might turn into a longer term WiP as I collect up more scraps so that the finished quilt ends up a decent size. For now, a lot of the fun is in the mystery of how each block will turn out. It felt good to get over half of the scraps out of the bin to make room for more! How do you decide when to raid your scraps and start a scrap project? I think we all just need to play every now and again and this looks like great fun – you will definitely have a lovely quilt at the end! I like how you play. I usually play with my scraps when I have creative block. Playing with the fabrics and just laying them out, can led to inspiration. Those blocks look great, Yvonne! Much better to have fun working and playing with those scraps to help the time go by while waiting. This wip is reminding me of a Crazy Mom Quilts type of quilt. I don’t often work on scrap projects. If I am working with solids, they get used up when I make my next quilt. 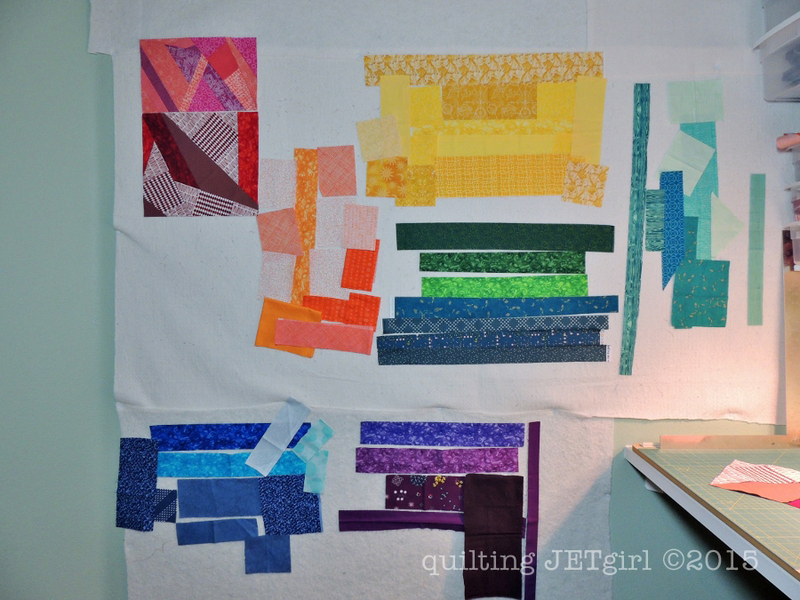 And so far my other scraps haven’t gotten to be enough to make into a quilt. I tend to be more likely to use them in a smaller project – like placemats or a table runner. I love where you are going with these blocks! Even if you have to put it away for a while, its something that you can easily pick up later or in between projects! Isn’t it funny to see which colors you have more of after sorting scraps?! I hope you keep us posted on this one!! It’s so fun seeing how those splashes of color cam together in such neat improv blocks. Can’t wait to see the rest of them. My scrap basket is out of control right now and overflowing onto the floor. I made a pillow with some of them the other day as a gift for a friend but am going to need to do some damage to the rest of the scraps sooner or later! That is looking fantastic! I’m really excited to see where you go with it. Lovely bit of play – I like what you have and would definitely vote for making more blocks as you generate the scraps. you know I LOVE a rainbow scrap quilt! I usually try to use as many of my scraps as possible in my backings, or if I have lots of one fabric line, I will make a preemie quilt out of them to donate so that too many scraps don’t go into my jars. By doing that, I have enough scraps to make a queen sized quilt just about every summer. This summer and last, I made my Shattered Rainbow quilts using only single-color scraps like you (leaving the scraps that don’t read as solid), but then I made my Kitchen Sink quilt with all of those. I guess, to answer your question, I try to use them up all year on tiny projects, but then every summer I tackle the jars. I think I might need to clean and organize now… My “scraps” are scattered all over the place. Some are grouped though, but not enough to pull off something like this and really get to play with them. 🙂 This is looking so fantastic Yvonne. I’m excited to watch it come together! 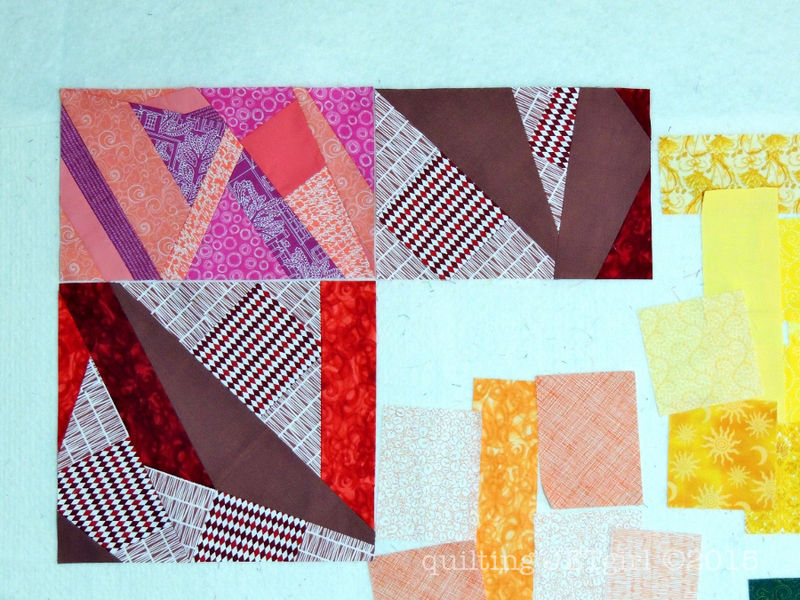 I’ve been going through scraps lately and thinking it’s time to make a scrap quilt maybe. You’re totally inspiring me! I love how you are adding in all the diagonal angles. I like them, I’ve considered doing something similar, but it scares me. I know that is silly, but I like having a plan (I think it is that left brain thing. Looks like fun! Your blocks have a lot of energy, and will make a zazzy-fantastic quilt! My scraps are stored by colour. 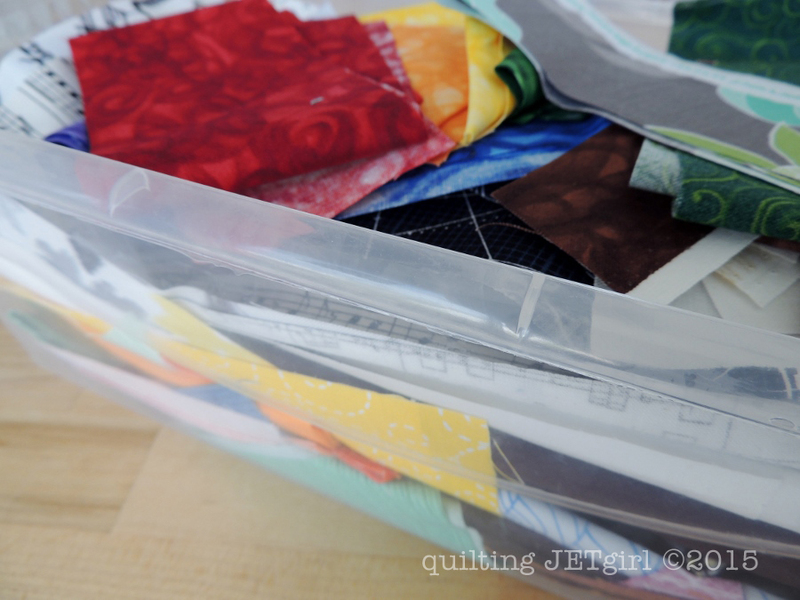 When a drawer (or two) fills up, I look for a way to make a quilt. 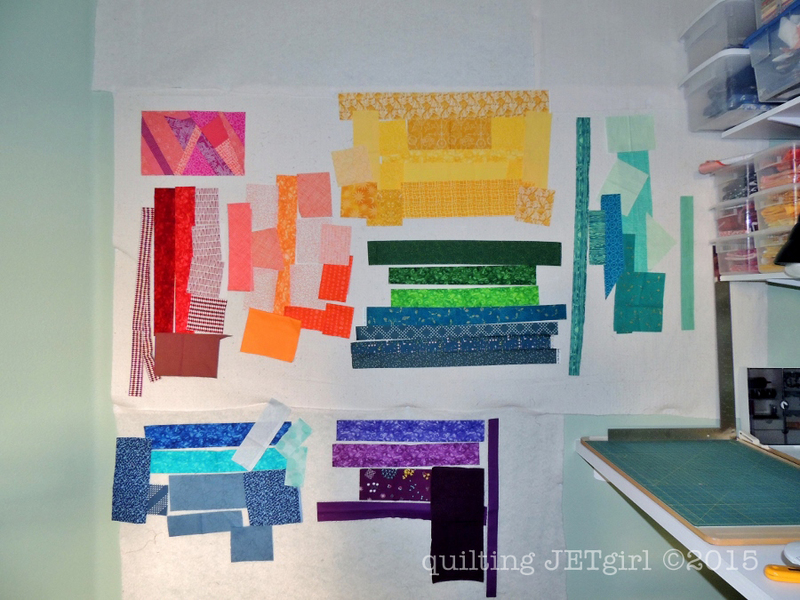 So far I’ve made a two colour quilt using only violets and yellows, a plus quilt using purples, oranges, and greens, and have started a rainbow slab quilt using Cheryl Arkinson’s slab method. I tend to use a tight colour palette when working scrappy, and am always happy with the result. I’m supposed to use my scraps, not just save them? Oh my! On a more serious note. I have a box of scraps that have been traveling with me since the 80s when I packed up quilting temporarily. At that time I didn’t have the variety I thought I needed for a scrap quilt like I envisioned(kinda like the one in my current post). And then the scraps got too overwhelming to deal with when I finally had “enough.” I just kept finding bigger boxes. Meanwhile I came across Bonnie Hunter’s scrap system and created my own variation. Cut a piece (less than 10 inches) into largest possible square, and keep moving down till nothing but crumbs and put them into the crumb jar. I sort squares by value more than color after they are cut and crumbs by color. And when a project needs them, I get them out. I know you are not the tiniest, ittiest, bittiest surprised, but I love the idea of a rainbow scrap quilt, and yours is looking good! I’ve only just begun to reach into my scrap bin with my latest #sewtake20 log cabin blocks, but I suppose I haven’t been quilting long enough to have warranted a scrap bin raid before now. I also tend to fold most scraps and return them to my fabric stacks, since I typically have fat quarter cuts and use a little bit at a time (or buy for a particular project and therefore use almost all of the purchased fabric.) I’m in dire need of a fabric organization intervention. How small is small enough to warrant the scrap bin? I like what you did with those scraps. Improv is always a good thing because you may stumble upon something new or an idea that you want to run with. My scraps will often wind up in a scrappy quilt or become the scrappy back of a quilt. I love these kind of quilts. I’ve been thinking of doing the same. Grabbing colors and sewing some blocks. I’ve never done improv, so I keep sitting on it! So far your improv blocks are looking great. I think the amount of white in the marsala blocks adds a lot of depth to those blocks. I like that process of putting the scraps up on the design wall. I’ll have to use it myself sometime. The blocks look great. I wish I could do improv like that. I’m a planner and need a pattern. Can’t wait to see more blocks. Cool improv! I decide to make something with my scraps when the lid won’t stay on the box! I love vibrant colours. Your blocks are beautiful. Looks a fun way to wait for thread! And how good to have a design wall to play with it like that. I don’t tend to get lots of scraps in quite that way, I suppose since I’m almost always making in quite an improvised way to start with, I often tend to cut to fit my fabric pieces, and they’re not usually particularly standard shapes and sizes in the first place! I do have a big basket full of pretty small bits that I use more for applique, and anything else just feels like normal fabric to me rather than scraps. I have all of my scraps in coordinating bins but I don’t really know what to do with them at this point. I have an improv phobia and too many fabrics mess with my OCD. At some point those bins aren’t going to hold all my scraps at which point I’ll have to figure something out! Yay for scrappy projects – so much fun! Love how you are making yours rainbow focused. I cannot believe how coordinated your scrap bin is! These fabrics all look good. I start to play in the scrap bin on a whim, or when I see a pile of stuff that might work together. I love this. I want to do that too. Great idea! Can’t wait to see it all done! 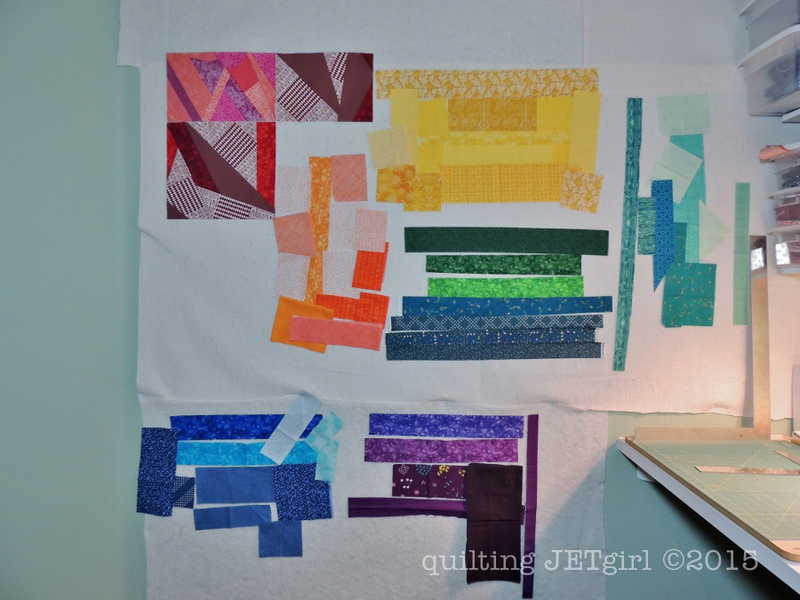 I don’t have a million scraps yet – or maybe I do. My problem is to decide what’s a scrap. If I take a small cut from a FQ I still save it on my fabric shelf. Only when I have little pieces (2″-3″ wide x fq length) I’ll throw in a scrap box. When do you decide your piece is scrap pile worthy? I just read your blog for the first time and will begin following your postings. I think a lot of us have rainbows on our minds right now. I started creating monochromatic scrap blocks when the Supreme Court decision was announced last month and have 9 16 by 11 blocks created so far that make a lovely rainbow on my design wall. Haven’t decided what the final result will be, but it was fun to see you were thinking along the same lines. I’m excited to read your tips on blogging about quilting. I’m fascinated to get more involved, but wonder if I have anything unique to share. I look forward to learning more from you. Love your rainbow blocks! Looks like you have something fun to work on when you need a break from a project. 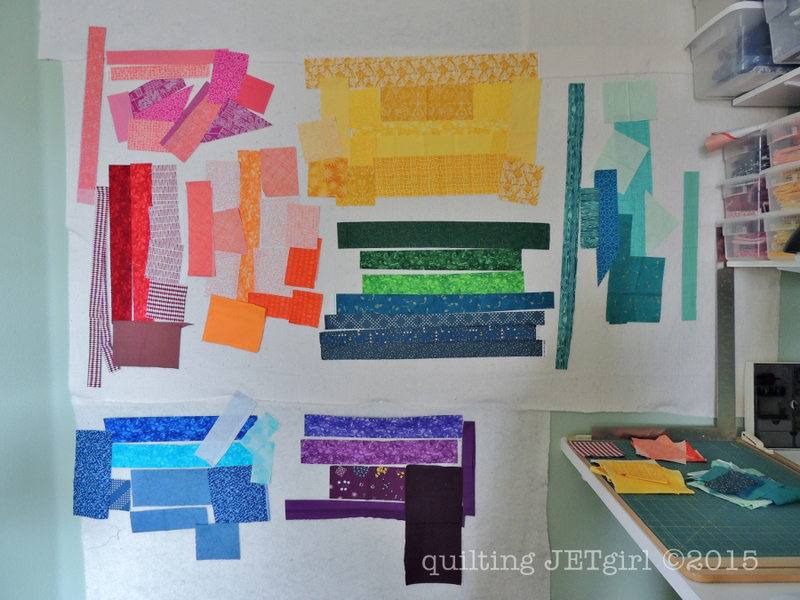 I usually use my scraps when I feel like I have enough for a project and the time to do it.